The Eurasian Black Vulture or Cinereous Vulture (Aegypius monachus) is very rare (BirdLife International 2000; Svensson 2009). Populations have been declining for more than a century and the species has been extirpated from many countries where it once bred. In Europe, only around 1000 pairs remain (most of them in Spain). This species breeds in arid, wild mountain terrain and in extensive lowland forests with hills or rocky outcrops. These enormous vultures (over 1 m long with a wingspan approaching 3 m) feed mainly on carrion (mostly mammals), although they occasionally take live prey such as lizards and tortoises. Eurasian Black Vultures breed in the spring and tend to congregate in loose colonies. In Europe, nests are nearly always in trees (usually evergreen oaks and pines), but in Asia they may also nest on rocks. Their huge stick nests are 1 to 2 m wide and 1 to 3 m deep. With very rare exceptions, clutch size is 1 egg. The incubation period is around 50 to 60 days and hatched young fledge at around 95 to 120 days. Hatching success is high, but many pairs do not breed every year. In captivity, the maximum known lifespan is 39 years. Although this species is threatened on a global scale (mainly due to habitat loss, reduced carrion availability, accidental poisoning, and direct persecution), in recent years concerted conservation efforts have seen significant success in some countries, notably in Spain. Margalida et al. 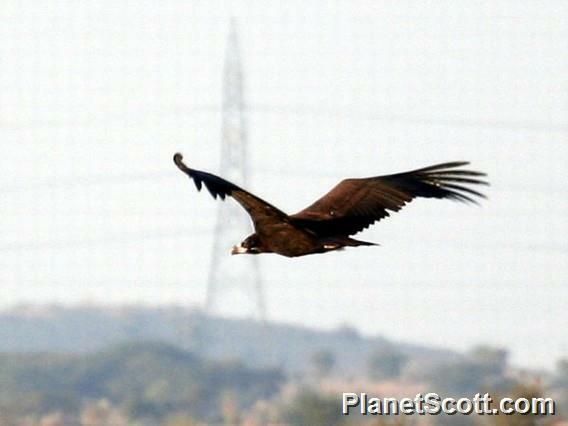 (2011) discuss the challenges of minimizing the impact of activities associated with (see the traditional process ) on Eurasian Black Vultures breeding in Cork Oak (Quercus suber) woodlands in Spain.